As I have noted in previous posts, the president's budget request is not all about infrastructure/fencing/ "the Wall". Included in that request is $800 million for urgent humanitarian assistance. My colleague Dan Cadman has noted that this request is for "unspecified" assistance. I have recently returned from a tour of the Southwest border in western Arizona and eastern California, and I now have a better idea of what that money is intended for: to support the Border Patrol's expensive new mission as caretaker for thousands of members of family units and unaccompanied alien minors (UAC). 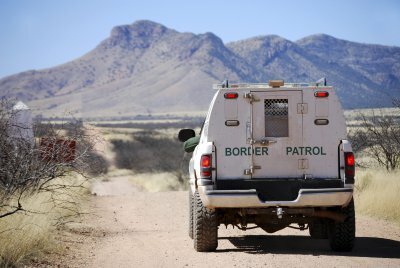 This is a staggering toll, and the responsibility to provide such aid is a far cry from the Border Patrol's primary mission: "to detect and prevent the illegal entry of aliens into the United States" and to "help maintain borders that work — facilitating the flow of legal immigration and goods while preventing the illegal trafficking of people and contraband." Unfortunately, the costs do not end there. In FY 2018, the sector incurred more than $700,000 in medical care costs to cover 1,700 aliens who were apprehended and who had to be transported to the hospital. Among those who required medical care were a 17-year-old girl, who broke three vertebrae when her smuggler told her to jump from the top of a 30-foot fence, and her 14-year-old sister, who followed after her and fractured her ankle. Other aliens show up sick, particularly children, some of whom are suffering from illnesses not generally seen in modern American society, including mumps, measles, and tuberculosis, as well as others with influenza, scabies, and other skin diseases. Plainly, the Border Patrol is not able to turn these individuals away without treatment. When the agents have a medical situation involving a child in a family unit, they have to stop the processing of the entire family as long as the child is sick in and in medical care. It is no wonder that the so-called "time in processing" for aliens apprehended in the Yuma Sector has increased from eight hours in 2005, when the majority of aliens who were apprehended were Mexican nationals who could be quickly returned across the border, to 78 hours today, when the majority of aliens who are apprehended are other-than-Mexican (OTM) family groups. These OTMs also require additional processing because of the added paperwork associated with their cases: determining their route of travel to the United States, taking biometrics, processing those who will be placed into removal proceedings, and planning for the return of those who will not be. There is one important caveat to the biometric aspect of this: By law, I was told, Border Patrol agents may not take fingerprints or photograph any alien under the age of 14. I will discuss the ramifications of those restrictions in a later post. In 2000, 1.6 million people were apprehended trying to cross the southern border into the United States. In 2001, 1.3 million were apprehended. In 2018? Less than 400,000. That's not just a decline. It's a significant decline. All of that is true. She fails to note, however, that Southwest border apprehensions are on pace to top 600,000 this fiscal year. And, as the foregoing shows, the demographic makeup of those crossing illegally has changed, in a way that makes the Border Patrol's job a lot more time-consuming. And expensive. Respectfully, if you don't recognize these facts, you're misinformed. And if the press does not report them, we will never be able to have an honest debate about border security. The Border Patrol will fail in its mission for lack of resources. Drugs will flow in at a higher rate, fiscal costs will increase in communities across the country, and the American people will suffer. Last edited by GeorgiaPeach; 02-11-2019 at 03:06 PM. Stabilize them and send them right back to Mexico! NO TAXPAYER FUNDED MEDICAL CARE FOR ILLEGAL ALIENS! "the president's budget request is not all about infrastructure/fencing/ "the Wall". Included in that request is $800 million for urgent humanitarian assistance."